The Bellevue House was one of Cincinnati's famous hilltop resorts. The stench from the rotting whale corpse should have kept people away. 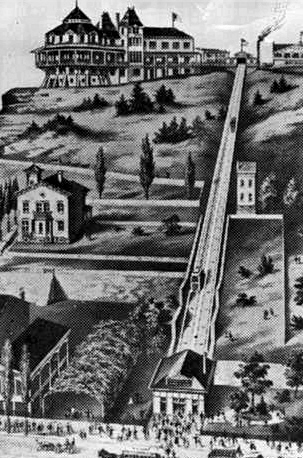 Instead, more visitors than usual made the trip up the hill on the incline railway to Mount Auburn to see if the poor beast was still alive. The people, drawn to the odor of the whale’s decomposing body, had actually come to the hilltop in search of fresh air. Cincinnati in the late 1800s was, as it still is, an industrial city. Smokestacks from factories and chimneys from mansions and tenements alike belched clouds of black smoke into the air. The smell of rotting blood from the meatpacking industry mingled with the pungent odor of fertilizer and the revolting stench of the Miami and Erie Canal that cut through downtown. All of this hung over the city in a cloud that was trapped by the surrounding hills, and people were desperate for clean air. Enter the whale. The animal had been brought to the Lookout House, a resort at the summit of Mount Auburn, in June 1877. Frank Harff, the proprietor of the resort, had a boxcar fitted with a tank to transport the creature to Cincinnati from the East. Harffs’ primitive aquarium was successful in attracting the masses to the hilltop. The Lookout House drew crowds of thousands, even on weekdays. One concert at the Lookout House in September 1876 drew 10,000. Patrons of the Lookout House found that food, fireworks, beer and dancing under the stars were all reasons to come and to stay. The whale, however, wasn’t happy in his 168,000-gallon tank of man-made saltwater, and was dead by Independence Day. 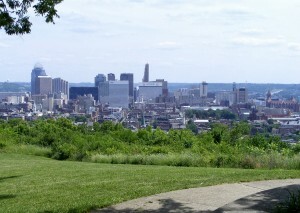 The view of downtown Cincinnati from Bellevue Park, the site of the former Bellevue House resort. Today there are no reminders of the hilltop fun of the past. A dinky swing set stands where the fabulous Lookout House once stood. A set of crumbling concrete steps to the bottom of the hill covers the ruins of the old Mount Auburn Incline, the very device that made hilltop development possible. The view of the city is obscured by overgrown trees that cover the rim of the hill. But thanks to a partnership between the Cincinnati Parks Department, the Uptown Consortium and the University of Cincinnati, this disappointing reality may change. Improvements to the steps, lighting and playground are planned. Signage indicating the incline ruins is included in the redevelopment master plan, which was created in 2006. The plan for Jackson Hill Park calls for a community green at the hilltop, with a clear view to downtown from a “Grand Stairs.” A tree-lined promenade from Jackson Hill Park along Dorchester Avenue to Hopkins Park, as well as streetscape improvements along Auburn Avenue, is included in the master plan as well. One of the piers that supported the incline bridge over West Clifton Avenue. The Uptown Parks Revitalization Plan calls for a wide clearing from the overlook at Bellevue Hill Park down to the back of the old pier on Clifton Avenue, with interpretive landscape elements and signage. Terraces, trails and a green will add to the public’s enjoyment. Fairview Park has possibly the most impressive ruins of its incline. 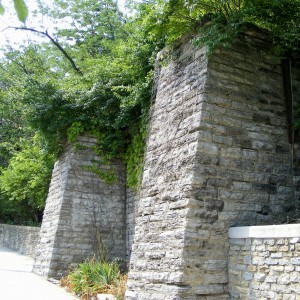 Anyone who makes the vigorous hike up the hill through the poison ivy from the street will be met with a set of four massive stone ruins that clearly trace the path of the incline. A clear view of the ruins, as well as a landscape interpretation of the incline, will make the park a significant destination. A water play feature, playground improvements and streetscape design are on the drawing board. The dangerous intersection off McMillan Street will be closed, and the one-way street will become a two-way loop with designated parking areas. Burnet Woods, UC’s neighbor to the north, is an important element in the revitalization plan. The design team is proposing a restaurant on the western edge of Burnet Woods, facing Good Samaritan Hospital. Whittaker claims that the park’s reputation for violent crime wasn’t supported by police records, which were examined during the course of the project. Nevertheless, there are plans to make the street through Burnet Woods a circuitous path, “not so much a cut through as a loop,” Whittaker explained. The entrance from Martin Luther King Drive will be closed, and the entrance from Ludlow Avenue will be for pedestrians only. Improvements to the walkway around the lake are planned with the possibility of additional lighting. “Look at what you have in Uptown,” Tony Brown, CEO of the Uptown Consortium, told the Business Courier in a March 10, 2006, interview. Distinctive shops, music venues and a cluster of well-reviewed ethnic restaurants have been fixtures of the neighborhood for decades. Safe, tree-lined streets that lead from the unique streets of the Uptown neighborhoods to historic parks with incredible views are what the consortium is after. To this end, the Uptown Consortium’s safety and transportation plans for Uptown integrate logically with the Parks Revitalization Plan.